If you’re like me, the sight of a circuit board and its electronic components fills you with a sense of joy (ok, maybe something a little less than joy, but just a little). Your mind enters that inspired mode which causes the creative juices to flow, conjuring up those ideas that sit on the backburner of your brain. The odds are that most of the electronic components on those boards will include these 7 fundamental components. One of the first things you should do when learning electronics is to familiarize yourself with the most common electronic components found in circuits. Resistors resist the flow of electrons (current) through them, controlling the voltage or current in a circuit. They are constructed to have a specific amount of resistance to the current, measured in Ohms. As well as their resistance, resistors have a power rating measured in Watts, which is basically their robustness. They are not only used for limiting current – they can also be used as voltage dividers for producing precise voltages. For calculating resistance, voltage, and current, Ohms Law is used. V=IR where V=voltage, I=current, R=resistance. There are many types of resistors including fixed, variable, high power, etc. Capacitors store an electric charge, producing a static voltage (potential difference) across its two terminals. They consist of two or more parallel plates separated by a non-conductive material called the Dielectric. Their value is measured in Farads which are large units, so sub-multiples are used such as micro-, nano-, & pico-farads. When connected to a DC circuit, they charge up to their supply voltage, like a rechargeable battery but much quicker. Placing a resistor in series with a capacitor slows the capacitor’s charging (and discharging) – the basis of timing circuits. There’s many types of capacitors. Two main types: polarized & non-polarized. Polarized capacitors have + and – pins. Inductors store energy in a magnetic field which causes it to oppose changes in current. They are measured in Henrys which is a large unit, so sub-multiples are used such as micro-, nano-, & pico-henrys. They can be used with capacitors to provide filtering of unwanted signals, smoothing out rectified AC for pure DC, etc. Much more on what Inductors are and what they are used for can be found here. Diodes conduct current in one direction and block it in the opposite direction. They are often used in power supplies to convert alternating current (AC) to direct current (DC). They are also used with high frequencies such as in radio, TV, and digital and computer circuits. 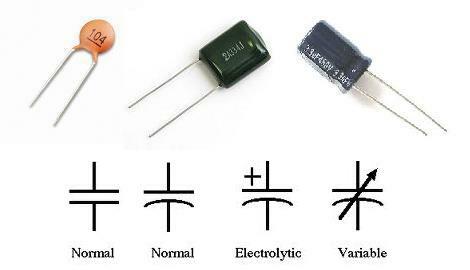 There are many types of diodes. Two main types are Power and Signal. Power diodes can handle higher currents. There is a threshold for them to conduct in the “right” direction – usually about 0.7V. If a high enough voltage is applied in the “opposite” direction, the diode will break down and let the current pass. Transistors can be thought of as water taps. They control the amount of current flowing through them. Transistors are controlled by a small current, which switches or amplifies a larger current – the basis of amplification. They usually have three pins labelled Base, Collector, and Emitter. The B->E current controls the C->E current. A small amount of B->E current produces a C->E current which might be 100X more – depending on the transistor. There are different types of transistors, a common one is the “bipolar junction transistor” (BJT) (shown below). There are two versions of the BJT – NPN and PNP. The main difference between these is the direction of the current. ICs can be so many different things. 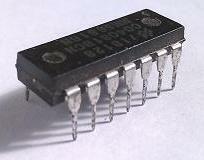 They can be a timer, an amplifier, memory (RAM/ROM/etc), a microprocessor – anything! LEDs emit light when a current is passed through it in the “right” direction. LEDs are much more efficient than incandescent lamps and bulbs as they don’t produce large amounts of heat. They come in many colours, and there are even ones which produce different colours depending on the direction of the current. The colour are not determined by the colour of their plastic body – it’s determined by the wavelength of the light emitted by the semiconductor compound. Use the navigation menu or click Home to continue learning electronics.